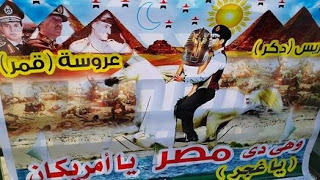 My impressions of the short-term future for Egypt are bleak, and they aren’t changing. Not much point in going on about that but when I come across an insightful piece that really adds relevant detail, re-blogging is warranted. As usual, my source is the terrific Arabist site, and the author my favorite correspondent, Ursula Lindsey. Now that campaigning for Egypt’s presidential election is well underway and Field Marshal Abdel Fattah El Sisi has made several media appearances, some observations can be made about the man who is expected to be Egypt’s next president. The former military commander is running a very controlled campaign, one in which he does not open himself up to any impertinent back-and-forth. In his media coming-out a few weeks back, he immediately bristled when would-be interviewers Ibrahim Eissa and Lamees Hadidi even gently pushed him, warning Eissa “I won’t allow you to use that word again,” about the apparently derogatory terms “askar” for the army, and admonishing them: “Are you going to talk or you going to listen?” The interview was pre-recorded, and glaringly failed to include what might have seemed like obvious questions (such as, given El-Sisi now oft-professed love of Egyptian women, how he defended forced virginity tests for female protesters two years ago). The field marshal’s electoral program remains shrouded in mystery. In an unorthodox move, his campaign has simply decided not to burden themselves with explaining how his vision might actually be implemented. His own campaign manager has told the press that presenting a program at this point “would provoke a discussion and debate that we don’t have the time to react to.” His few policy proposals (giving young men refrigerated trucks to deliver vegetables to market; encouraging the use of energy-efficient lightbulbs to face the electricity shortage) seem risibly modest, and when pressed on how he would actually implement them, the mushir simply says that the state will “make” people adopt them. El Sisi prefers to wax poetic about the extraordinary personal qualities of the Egyptian people, and his boundless love for them, rather than to address specific policy questions. He is clearly well-aware of his popularity with women, which he constantly plays to (although he seems incapable of imagining working women — his idealized Egyptian Woman is adamantly domestic, anxiously watching over her home and wisely encouraging her man to action outside it). El Sisi is charismatic; he is also terribly aware of it. He radiates self-regard. His soft-spoken delivery is that of a man never used to being interrupted. But his veneer of kindliness and patience rubs off awfully quickly, the moment he is challenged. The unspoken message of his entire campaign is that he is actually above competing for the position — it is already rightfully his, and he is accepting it as a patriotic sacrifice. One shouldn’t under-estimate the appeal of his displays of emotion or his paternalism (two sides of the same coin). Many Egyptians are waiting for a strong man to “take the country in hand”; they won’t bristle at the way he amalgamates the army and the state to his own person (rhetorically telling protesters and strikers: “I don’t have anything to give you!”, as if the country’s budget and his own bank account were one and the same). But it is hard to gauge the field marshall’s true level of support when the entire transitional period has been aggressively engineered to ensure his candidacy an aura of inevitability. Both Sadat and Mubarak stumbled into their jobs. El Sisi is coming to the position as a savior. This is a man who doesn’t just want to be obeyed; he insists on being loved. This is a man who thinks he’s the smartest guy in the room (with some cause: he has outwitted all his adversaries over the last few years). El Sisi’s recent media appearances should put to rest the delusion that there is going to be any relaxation of repression after he is elected. He has much at stake himself, and he heads a nexus of deep and powerful counter-revolutionary forces (both regional and institutional). He defended the protest law and has lectured the media about not advocating for freedom or focusing on the government’s faults. He has taken a great, so far successful, risk since June 30, 2013, but he must be well aware that if were ever to fall out of power, there is much he could be held accountable for. And given the fates of Egypt’s last two presidents, and what we’ve seen of his temperament, he seems extremely unlikely to let opposition pass. Recently came across this Japanese photographer and his fascinating visualization of love. It makes for an interesting symbol for the kind of love that the will-soon-be-head-of-state expects? envisions? of his children? subjects? This entry was posted in society and tagged Egypt, Hal, political analysis, The Arabist, Ursula Lindsey. Bookmark the permalink.